Armies. As signed into effect by Lord Canning, Dalhousie's successor as Governor-General, the act required only new recruits to the Bengal Army to accept a commitment for general service. However, serving high-caste sepoys were fearful that it would be eventually extended to them, as well as preventing sons following fathers into an army with a strong tradition of family service. There were also grievances over the issue of promotions, based on seniority. This, as well as the increasing number of European officers in the battalions, made promotion slow, and many Indian officers did not reach commissioned rank until they were too old to be effective. On 29 March 1857 at the Barrackpore parade ground, near Calcutta, 29-year-old Mangal Pandey of the 34th BNI, angered by the recent actions of the East India Company, declared that he would rebel against his commanders. Informed about Pandey's behaviour Sergeant-Major James Hewson went to investigate, only to have Pandey shoot at him. Hewson raised the alarm. When his adjutant Lt. Henry Baugh came out to investigate the unrest, Pandey opened fire but hit Baugh's horse instead. General John Hearsey came out to the parade ground to investigate, and claimed later that Mangal Pandey was in some kind of "religious frenzy". He ordered the Indian commander of the quarter guard Jemadar Ishwari Prasad to arrest Mangal Pandey, but the Jemadar refused. The quarter guard and other sepoys present, with the single exception of a soldier called Shaikh Paltu, drew back from restraining or arresting Mangal Pandey. Shaikh Paltu restrained Pandey from continuing his attack. After failing to incite his comrades into an open and active rebellion, Mangal Pandey tried to take his own life, by placing his musket to his chest and pulling the trigger with his toe. He managed only to wound himself. Court-martialled on 6 April, he was hanged two days later. The Jemadar Ishwari Prasad was sentenced to death and hanged on 22 April. The regiment was disbanded and stripped of its uniforms because it was felt that it harboured ill-feelings towards its superiors, particularly after this incident. Shaikh Paltu was promoted to the rank of havildar in the Bengal Army, but was murdered shortly before the 34th BNI dispersed. Sepoys in other regiments thought these punishments were harsh. The demonstration of disgrace during the formal disbanding helped foment the rebellion in view of some historians. 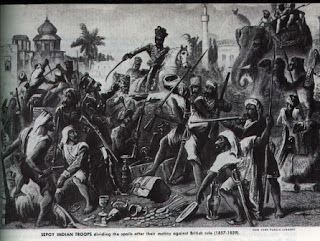 Disgruntled ex-sepoys returned home to Awadh with a desire for revenge. Bahadur Shah Zafar was proclaimed the Emperor of the whole of India. Most contemporary and modern accounts suggest that he was coerced by the sepoys and his courtiers to sign the proclamation against his will. In spite of the significant loss of power that the Mughal dynasty had suffered in the preceding centuries, their name still carried great prestige across northern India. Civilians, nobility and other dignitaries took an oath of allegiance. The emperor issued coins in his name, one of the oldest ways of asserting imperial status. The adhesion of the Mughal emperor, however, turned the Sikhs of the Punjab away from the rebellion, as they did not want to return to Islamic rule, having fought many wars against the Mughal rulers. The province of Bengal was largely quiet throughout the entire period. The British, who had long ceased to take the authority of the Mughal Emperor seriously, were astonished at how the ordinary people responded to Zafar's call for war. Initially, the Indian rebels were able to push back Company forces, and captured several important towns in Haryana, Bihar, the Central Provinces and the United Provinces. When European troops were reinforced and began to counterattack, the mutineers were especially handicapped by their lack of centralized command and control. Although the rebels produced some natural leaders such as Bakht Khan, whom the Emperor later nominated as commander-in-chief after his son Mirza Mughal proved ineffectual, for the most part they were forced to look for leadership to rajahs and princes. Some of these were to prove dedicated leaders, but others were self-interested or inept.